In December 2015, 197 countries took part in the 21st UN Conference of the Parties (COP21), 174 of which signed a universal and legally binding climate agreement. The Paris Agreement aims at slowing global warming by keeping global temperature increase “well below 2 °C”. Despite signing countries’ commitment, achieving this goal is not an easy task. Researchers Yann Robiou du Pont and Malte Meinshausen showed in an article recently published by Nature Communications how this framework might fail at attaining the targeted temperature increase. According to them, we should set the aspirational level to 1.3 °C to achieve the “well below 2 °C” threshold. While the findings of the mentioned paper may make the challenge seem more difficult, rapid technological development is expected to play a significant role in decreasing global warming and so limiting its consequences on the planet. 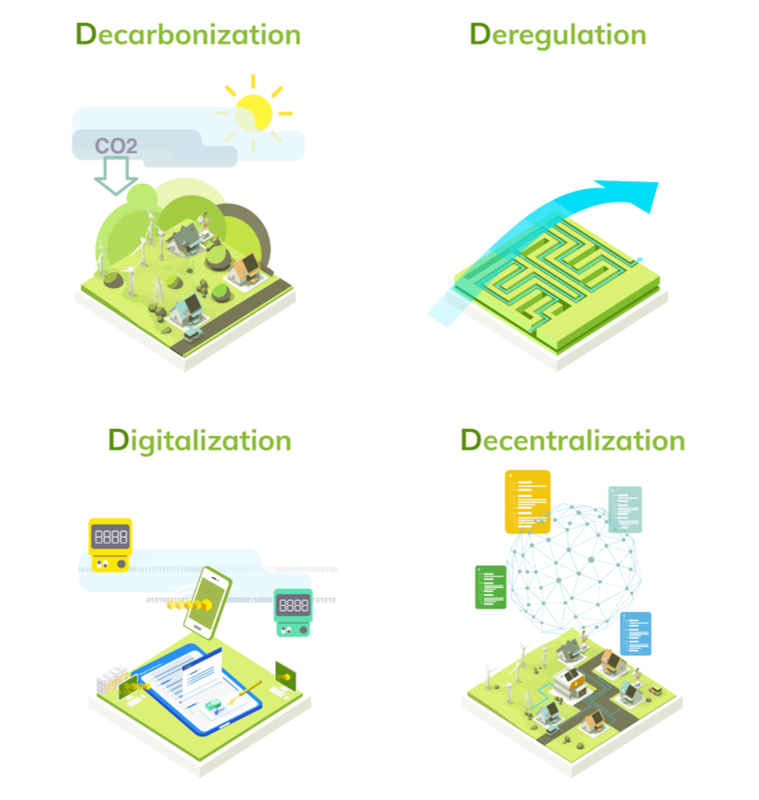 We identified four driving forces called the “four Ds” by the energy industry, fuel energy transformation: Decarbonization, Decentralization, Digitalization, and Deregulation (or Democratization). Technological advances in energy generation and storage systems, Internet of Things, Artificial Intelligence, and distributed ledgers promise to speed up energy transition on these four axes. This article intends to draw an overview of the current trends in the energy industry, how it progressed regarding energy transition and how it may evolve in the next few years. We will focus on factors that give us an idea about the adoption of the technologies stated above, such as the evolution of their respective costs and market size. Decarbonization is, without doubt, the cornerstone to limit global warming. Slowing the global temperature increases means bringing greenhouse gas emissions (mainly carbon dioxide) to a net zero. In the long term, we could achieve by generating our energy mainly with renewable energy sources. The current indicators allow us to be cautiously optimistic about a scenario in which renewables are the primary source of energy. The average annual growth of renewable energy capacity has been around 8–9% since 2008. In 2017, the added capacity reached 167 GW globally, of which 94 GW came from solar PV and 47 GW from wind power. Because of this constant growth over the last decade, renewable energy now accounts for a quarter of the total global power generation; a record level reached in 2017. A decline in costs can explain this continuous growth. Indeed, a combination of technological innovation, economies of scale, and manufacturing experience allow reducing costs. For instance, wind turbine prices have decreased by 32% since 2010. Meanwhile, the prices of PV modules have been showing a 28.5% learning rate during the past 40 years. This means that for every doubling of cumulative capacity the cost of a PV module drops by 28.5% on average. Besides, the most critical component in the economics of PV plants, capital expenditure, is expected to be cut by half by 2035. On the other hand, the building sector seems to be less promising because of slow renovation rates. The 1% annual rate requires a three-fold increase to speed up the electrification, and consequently the decarbonization of the construction industry. The reduction of greenhouse gas emissions also involves a more efficient, flexible, and resilient energy production. In practice, we can achieve this through distributed generation and storage in a decentralized grid-architecture. Thus the development of utility-scale and behind-the-meter stationary storage systems is of crucial importance to store excess energy produced by DERs (Distributed Energy Resources). In this regard, the Bloomberg NEF 2018 New Energy Outlook expects the cost of battery packs for stationary storage applications to fall by 66% between 2018 and 2030. According to the report, both utilities and (particularly) consumers will profit from this cost reduction — a forecast projects that behind-the-meter energy storage capacity will represent 66% of the total worldwide energy storage capacity in 2024. Another critical factor is the expansion of the EV market which will increase global EV energy storage demand. As a result, Bloomberg NEF forecasts an increase in global investment in new built energy storage from $2.3 billion in 2018 to $8.2 in 2024. 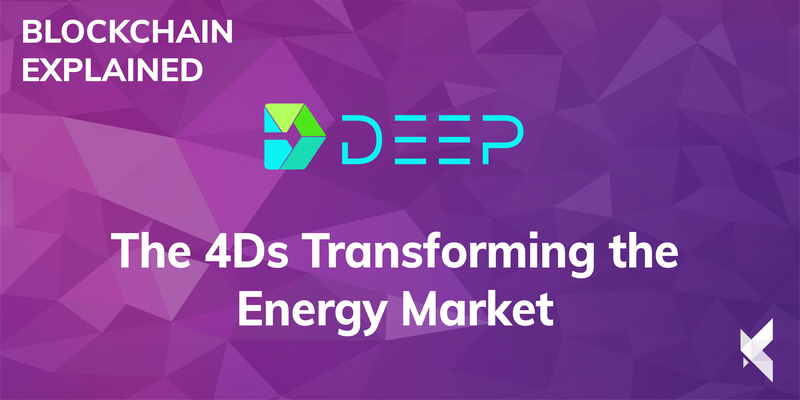 A decentralized energy industry demands that real-time data about energy production and consumption at various points in the grid must be accessible and reliable. In addition to a software layer that is needed to manage and process all the data-flows, a hardware infrastructure is necessary to collect the data in the first place. This infrastructure will consist of a network of connected objects such as smart meters to record energy consumption and sensors that provide information about the state of the electric transmission grid. The statistics and forecasts we found promise a widening adoption of such devices. Indeed, the number of connected devices worldwide is expected to exceed 75 billion in 2025. More precisely, the installed base of smart meters for electricity, gas, and water is projected to reach 1.6 billion units in two years. Historically, utilities emerged as state-regulated monopolies, and they still are in some countries. In a regulated energy market, the government has control over electricity prices, which leaves little room for competition and little choice for customers. However, with the global energy demand increasing, the new capital investments required exceeded the capacities of governments. Unable to create new sources of funding, the governments of many countries started to turn to the private sector and therefore deregulate their energy markets. Globally, the European Union seems to be leading in energy market deregulation. In 2003, fourteen out of the fifteen EU nations agreed to open their markets by 2007 and increase free trade with other countries. The agreement fostered competition between companies but did not include policies promoting small-scale distributed energy generation until very recently. On November 12th, 2018, EU negotiators agreed upon a legal framework for “citizen energy communities” that guarantees their right to energy sharing. European energy communities are now allowed to own, rent, or buy their electricity distribution network. Even so, more efforts need to be provided to find the appropriate market design that will allow citizen communities and SMEs to generate and distribute energy on a small scale, making them part of the energy transition. Despite being a long and hard road, energy transition is our only hope to avoid a catastrophic scenario where global warming levels exceed a point of no return. Although currently insufficient, humanity is progressing on many levels to guarantee a sustainable and efficient energy transition. Myriad technologies are our primary instruments to achieve the ambitious targets that are required. These technologies promise to change the energy market as we know it completely, whether on the level of infrastructure, applications, or services. The potential coming from such disruptive technologies requires us to think about the possible threats that we need to anticipate and the business models that we should start developing.